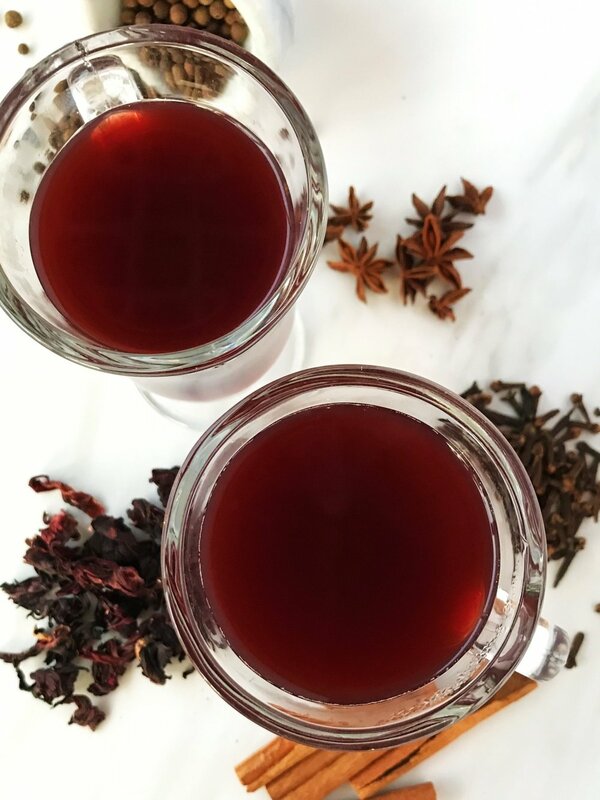 Mulled apple cider infused with tart hibiscus flowers and mulling spices. Hibiscus Mulled Cider photographed in our Adventure Kitchen Pop-Up Spice Shop. We infuse apple cider with hibiscus flowers and classic mulling spices for a warm and tasty drink on a cold day. 1. Combine all ingredients in a medium saucepan over medium-high heat. Stir occasionally as the cider becomes piping hot. 2. Turn the heat to medium low, partially cover, and allow the spices to infuse into the cider for about 30 minutes to one hour, stirring occasionally. Adjust the heat as needed to keep the mixture hot, without letting it boil. 3. Strain the solids and serve hot. This is the Hibiscus Mulled Cider we’re serving at the Adventure Kitchen Pop-Up Shop this winter. It’s a slightly tart, deep ruby red cup of warming goodness, and everyone loves it! When we make it for the shop, we use the high end of the range of quantities listed for each ingredient, and the drink is packed with flavor. But you might not have gobs of allspice or hibiscus flowers hanging around your kitchen (what, you don’t run a spice shop?). I wouldn’t want that to stop you from making this! If you make it with the lower end of the ranges, you’ll still love it. If you’re new to the mulled cider universe, here’s the deal: you take some apple cider and steep it with “mulling spices” over low heat for awhile, to let all that spice-full goodness infuse itself into the cider. The whole thing is really simple. Just don’t leave the spices in for too long, or the cider will turn bitter. Classic mulling spices are things like cinnamon, allspice, anise, cloves and cardamom; in this recipe, I’ve nixed the cardamom so we could take a scenic route to Mulling Town by way of a Latin/Caribbean side side street called Hibiscus Flowers. The net effect is a slightly tangy, beautiful ruby-red drink that everyone loves. People in our spice shop loved this drink so much that they asked me to put the mulling spices in a jar for them to take home! If you are one of those people (hello! ), use about 1/4-1/3 cup of the jarred mulling spices per quart of apple cider. Happy mulling! A blend of hibiscus flowers, cinnamon sticks, allspice, star anise and cloves. Steep in warm apple cider for a Latin/Caribbean twist on the classic mulled cider.